I keep meaning to write about the brand new mapping I got mid-October. My audiologist switched me from the SPEAK speech coding strategy program to ACE speech coding strategy program and broadened the range of sounds that my CI can pick up. Basically the SPEAK program is an older strategy program. My understanding is that it is not even available on the Nucleus 5 CI that came out last year. One of the reasons I ended up going with Cochlear Americas vs Advanced Bionics (even though I was pretty close to picking AB) was that Cochlear offered this SPEAK program. My general understanding (please correct me if I’m wrong) of the SPEAK speech coding strategy program is that it processes sounds slower. This helps with the brain recognizing sounds especially if a person has a similar hearing loss background as mine. This generally works better for deaf people who have been deaf their whole life, were implanted late, and don’t have speech perception. I really like the ACE program and am glad I was able to give this a try. I do want to make it a point that I am VERY glad I was able to be programmed with SPEAK the first 19 months. I do not think I would have adjusted to the CI as well if it had not been for the SPEAK. I really struggled for a long time (and still do at times) with being over-stimulated. The SPEAK program helped greatly with this. My audiologist wasn’t sure how well I would handle the ACE program so she left the SPEAK program on my CI in case I wanted to switch back. I have played around with switching back to the SPEAK but usually go back to ACE within 5 minutes. I do have to admit that it is harder to turn the CI on in the mornings with the ACE than it was with the SPEAK. It’s such a jolt. Sometimes I find myself avoiding turning it on because of that jolt but then I remind myself it only takes 5 seconds to adjust to it. Then I can go on with the rest of my day just fine. I was mapped with this whole brand new program the day before I left for the NSGC conference which wasn’t the best idea but it turned out okay. Words, environmental sounds, and background sounds did sound differently than with the SPEAK. I had to adjust very quickly so I could get used to what I was hearing at the conference. One mistake I did make was that I had taken my CI off for a nap on the flight to the conference. I usually leave my CI on if I can when flying. However, it kept falling off because I was leaning against the window on the implanted ear and I was worried I would lose it. I was half asleep when I decided to put it back on and I was sitting right next to the loudest part of the plane. Bad idea. I jumped out of my seat. Painful! Imagine if you had been sound asleep in a very quiet room and woke up to the noise of a jet right next to your bed. Yeahhhh…..not pleasant. One CI moment that has stuck in my mind for the past month occurred while listening to a presentation at the conference. I was sitting in a spot where I could not see the person who was speaking at all. Halfway through her speech, I noticed her voice sounded different. I could not put my finger on it. I kept trying to get a good look at her to see her expression but couldn’t see her at all. I must have looked really confused because my interpreter told me that the speaker was crying. In some ways I have had to relearn certain sounds with the ACE program because some things do sound different. I am still getting used to it but am enjoying it. I also had been having issues with the volume of sounds constantly changing throughout the day. Things would sound really soft at times and I was becoming frustrated. I would find myself having to constantly adjust the volume on my laptop and occasionally maxing out the volume. Now, it’s been very stable for the past month and half which has been wonderful. I hope to blog soon about one very big con that I have had with my CI ever since I’ve been implanted: Sirens. If it wasn’t for this issue, I would seriously consider going bilateral. It has made me rethink the whole CI + aid vs CI + CI thing. Sound booth tests with young children usually involve something with action or play. I am not going to go into details here. The basic concept is that it is difficult to tell if a young child is responding to a sound or not. Audiologists will teach a child to turn to a sound by using play or something with action to “reward” them. Growing up, there were always toys in small glass boxes attached to the sound booth wall. Every once in a while I would luck out and get entertained with 2 toys. One was usually a dog and the other toy was ALWAYS a cymbal-banging monkey. If there was only one toy, it was the cymbal-banging monkey. If I responded to a sound….the glass box would light up and the monkey would start banging his cymbals. I used to think that thing was creepy and still do. Later on, I was able to use the “I hear the sound, I’m going to raise my hand” method that older children use. The last time I actually saw that thing come to life was when I was around 3-5 years old. However, until a couple of years ago a creepy cymbal-banging monkey was always in a glass box staring at me during sound booth tests. It didn’t matter which audiologist I went to, it was always there. I even went to audiologists in 3 different states (NY, KS, and MO)….still there! It was like sound booths came equipped with those cymbal-banging monkeys. 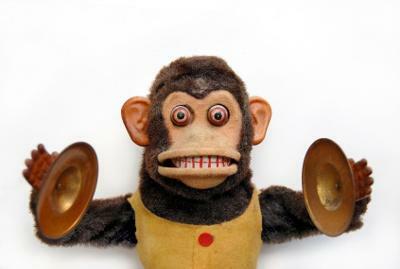 My current audiologist center does not have a creepy cymbal-banging monkey. They don’t have any toys in glass boxes (they use different play approaches with young children now) and recently upgraded to a new sound booth. I still picture that cymbal-banging monkey every time I enter that sound booth. I thought those things were extinct….until I watched Toy Story 3 last night and saw this. I went to an ASL Film, Black Sand, with a few friends tonight. I was glad the captions were on even though my primary mode of communication is sign language…my first language is English. You would think that after being exposed to Deaf culture for a while I would be used to seeing flying hands in the air. I still am not used to it and it still takes me a few minutes to adjust to it. It’s like I have to leave my “hearing hat” at the door. 🙂 I do enjoy it and it is a nice break from trying to lipread constantly. What I am the most used to is working with people as a team to have successful communication which oftentimes means meeting each other halfway. Most of my close deaf friends are not culturally Deaf. They will mouth as they sign or voice and sign (total communication/sim com). I grew up using a combo of both sign language and lipreading. I still get caught off guard when I see a large group of culturally Deaf people sign fluent ASL. Not a bad thing, but it does serve as a reminder that I truly do live in both the deaf and hearing worlds. That I am always trying to adapt to situations. It has taught me to have a go with the flow attitude. You may be wondering why I titled this post, Taco Bell. Well 4 of us decided to eat a quick dinner at Taco Bell before heading to the ASL Film which was at the local school for the Deaf. We bumped into 3 other friends while eating there. It is fascinating to me to see how easy it is to bump into other deaf people within a 5 mile radius of that school. 🙂 It does give me a sense of a community. It is amazing to see how aware and comfortable hearing people are when it comes to interacting with deaf people within that area. They don’t freak out. They don’t stare. They know how to communicate with deaf/hoh people. Only if the rest of the world operated that way. It is a nice escape every once in a while. I have blogged about this topic several times but wanted to c & p a blog post I made recently for the local HLAA (Hearing Loss of America Association) blog. Sometimes people ask me what it’s like to be deaf. It’s a difficult question for me to answer since I don’t know what it’s like to be hearing. I have to somehow understand what it’s like to be able to hear to fully answer this question. I do ask people what it’s like to be hearing which oftentimes lead to fascinating discussions. I have thought about this question many times over the year. There are many different ways I can answer this question. What is it like to be a deaf person in a hearing world? How has being deaf shaped who I am? How can I really understand what it’s like to be deaf if it’s the only thing I have ever known? How can I truly explain what it’s like to be deaf in a hearing world without launching in a 5 hour-long discussion? There are so many things to take into consideration. I do think that being deaf has allowed me to notice the small pleasures that are sometimes overlooked by hearing people because the world is a loud place. Colors are brighter. Body language conveys so much more than spoken words can. Oftentimes people just want to know what it’s like to live in a hearing world when I miss out on so much of what is being said around me. That’s the main point of their question even though I have came to interpret their question in so many different ways. One of the many answers that I try to offer when I am asked this question is for people to imagine what it would like to live in a foreign country if they didn’t know the local language. You might be able to get the general concept based upon figuring out a few words here and there. I think it’s the closest way a hearing person can come to experiencing what it’s like to be left out of conversations and learning that you can’t count on others to tell you what’s going on. You will feel more self-conscious and not as confident when you’re not sure what’s going on. You will quickly learn that only you and you are responsible for yourself. You also learn how to use the smallest clues to figure out what’s going on. Sometimes, I feel like I’m always trying to put together a puzzle using clues that many people overlook. As a deaf person I have learned how to be independent, take care of myself, and that sometimes the only person I can trust is myself. I know I can’t rely on being able to communicate with people around me to figure out where to go, what to do, etc. I’m also used to having to go with the flow, not knowing what’s going on, and expecting the unexpected. Being deaf in a hearing world can be very frustrating yet very rewarding. How do you explain what it’s like to have a hearing loss to those who ask you? Does the above list remind you of anything? Yep, it’s a few words from the list of 20-30 words that audiologists have used for many years as part of the sound booth test. Year after year I was expected to choose what word was being said from this list without lipreading. The list was ALWAYS the same. The list was usually given to me on a piece of paper with pictures to represent each word and I had to guess what was being said. It somehow came up during a discussion with a few other deaf buddies recently and apparently everyone had that list memorized. 😉 We never really understood why they didn’t spice up that list by throwing in a few new words every once in a while. When I went into for my cochlear implant evaluation last year, I had to do a few hearing tests with my hearing aids. One of the tests involved the audiologist saying words from a list (that I did not have in front of me) with her mouth covered. Well, I have never been able to understand speech without lipreading. I assumed she was shooting words from that same old list that I had became familiar with over the 20+ past years. This was a new audiologist and she was required to give this test as part of the cochlear implant evaluation even though I told her I wouldn’t understand anything she said without lipreading. So I sat there and it sounded like these were multi-syllable words so I started shooting off replies such as….”hotdog” and “airplane” that I had been “trained” to do. Turns out, they use an entirely different list for cochlear implant evaluations and follow-ups. I have a challenge for you but it will take effort on your part. This may not be ideal for a whole day but I challenge you to try it for at least a couple of hours. Every SINGLE comment and conversation you have with someone, I want you to think about that particular situation as if you hadn’t heard that particular piece of information. This will be challenging but try the best you can. -If you make toast in the morning. How would you know your toast was ready if you didn’t hear it? -If you take a shower in the morning. How would you know if the water was definitely off? -If you use the turn signal on your car. How would you know if the signal was on/off? -If you sat in at a work meeting. How would you know who was speaking at a particular moment? -If someone says something quickly to you in passing. What would you know if he/she was saying? -If you had lunch in a dimmed restaurant. Would you be able to understand others were saying? -If you take the subway. How would you know why the train was stalled? Or which train you were on? This activity is not intentioned to make you feel sorry for me or for people with hearing loss. Instead, it’s intentioned for you to view the world in a different way. Every single item you hear regardless of if it’s language or environment sounds….THINK about what you just heard and how it affects your reaction and thought process. Then THINK about what you would have done if you hadn’t heard it. As much as I love hearing with my cochlear implant and hearing aid, I truly do think people get lost in a world of sounds. There’s so much more to the world than just sounds. No, I’m not referring to being deaf. I have always been a bit different from everyone else. I grew up thinking it was a bad thing to be different, to think differently, and to have a different perspective. Now, I have accepted that I’m different and am loving that I’m different even though people may not always understand where I come from. Call it weird. Call it shy. Call it awkward. Call it abnormal. Call it what you want but I am who I am. Yes, it is lonely at times because I wish I could share my world with everyone else. I love getting sneak peeks of other people’s worlds but I have yet to figure out how to share my world without constantly being judged for thinking differently and questioning things.